A couple of weeks ago I bought a toy castle at a 'car boot' sale; it was rather large and more suitable for 54mm+ figures. I sorted through all the pieces and kept the most usable bits - 4 towers, nine wall sections and a rather large sort of keep. I've been sorting out how to use these bits today and decided to remove the bottom section of the towers and lower the wall sections pairing them together to give me 4 longer sections. The initial cut and bash can be seen here with a gatehouse made from another toy. The figures shown are from my 40mm ECW collection, at a push 28mm figs wouldn't look too out of scale. 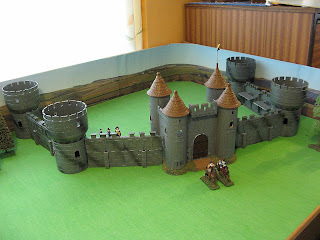 It looks good as a town wall or even re-arranged to make a small castle. I used the remnants of the walls and the bits from the keep building to make the basic shells of two buildings - a large manor house and a chapel with circular apse (again a 40mm fig shown for size comparison). after a short while rest of uhlans return and the regiment heads off to join with the infantry column. 40mm: Into the Hoflandt ..
Wittenberg having annexed the small region of Braunlandt belonging to Hesse-Limburger giving them control of important trade routes into the Imperium has decided to assert control of the region of Hoflandt which was the ceded to them as part of the peace of Witzend at the end of the 3rd Belgravian Wars. Holding the Hoflandt will give Wittenberg control of both sides of the river Oudear and enable them to control trade and provide a springboard to attack Monrovia from the south or to strike deeper into Saxe-Jarslberg. King Leopold has returned from a diplomatic mission. He had travelled to the northern part of the Duchy of Fenwick for a meeting with the Duke of Zomverre and representatives of Gallia to discuss Monrovia's aggressive activities in the region. Gallia is to send an ambassador to to Monrovia to express their discontent with their attack on Zomverre, the Duke of Fenwick has offered more troops to support the Duke of Zomverre's army. I've been away for the last week on a training course in Paris to do with my new job. Nice to travel but I did miss not being able to sit down at my modelling desk and get some painting done. I've been keeping up with everyones blogs using the TV Internet in the Hotel I was staying at. Managed to get out to see a couple of things during the evening, including the Eiffel tower. Its nice to be back home, on the modelling desk are some 40mm jagers to finish, I'm looking forward to painting them.